The world’s population of northern white rhinos is down to five and the Ol Pejeta Conservancy is home to three of them, including the last remaining male—which is being guarded by armed rangers around the clock. Along with the critically endangered northern white rhinos, the conservancy in Kenya is also home to 23 white rhinos and 105 black rhinos, making it the largest black rhino sanctuaries in East Africa. In an effort to protect the rhinos from poaching, and to possibly save the northern white rhinos from extinction, the conservancy enlists 40 armed rangers to patrol the 90,000-acre conservancy. The most important rhino is Sudan, the 40-year-old male northern white rhino that is under constant surveillance, as are two females. Sudan isn’t always surrounded closely by armed guards, as “we try and let our rhinos be ‘wild’ as much as possible without human interaction,” Eldoie Sampere of the conservancy told GrindTV. To increase security, Sudan was fitted with a radio transmitter, and its horn was removed. Sudan and three other northern white rhinos were obtained by the conservancy from a Czech Republic zoo in 2009 in hopes of breeding the rhinos, a goal yet to be attained. 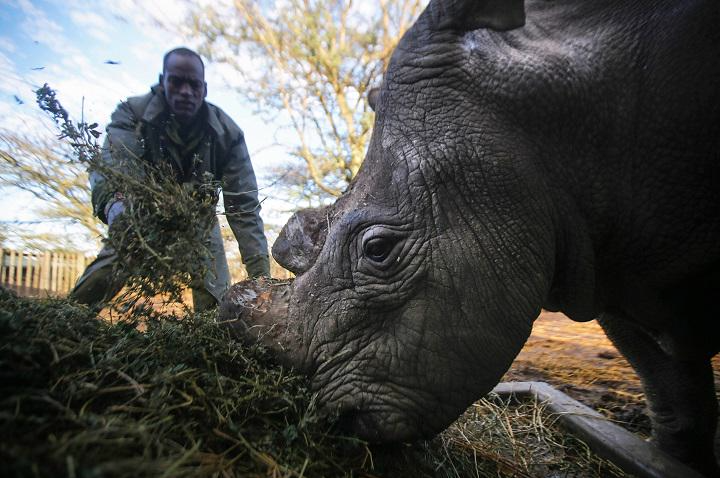 Suni, a 34-year-old male, died last October, leaving the existence of the northern white rhino up to Sudan. Sudan, the last northern white rhino male in existence. Rhino horns, prized in Asia for its ancient belief that they can reduce fevers and seizures, have no medicinal value. It’s said to be like biting your fingernails. Nevertheless, rhino horns command big money—$30,000 per pound. The Kenya Wildlife Service says 54 rhinos in general were killed by poachers in 2014, according to Inquisitr.com. From 1960 to 1980, the population of more than 2,000 northern white rhinos was reduced to only 15 because of widespread poaching, and now it’s up to Sudan to keep the species alive. And it’s up to the armed rangers to keep Sudan alive. 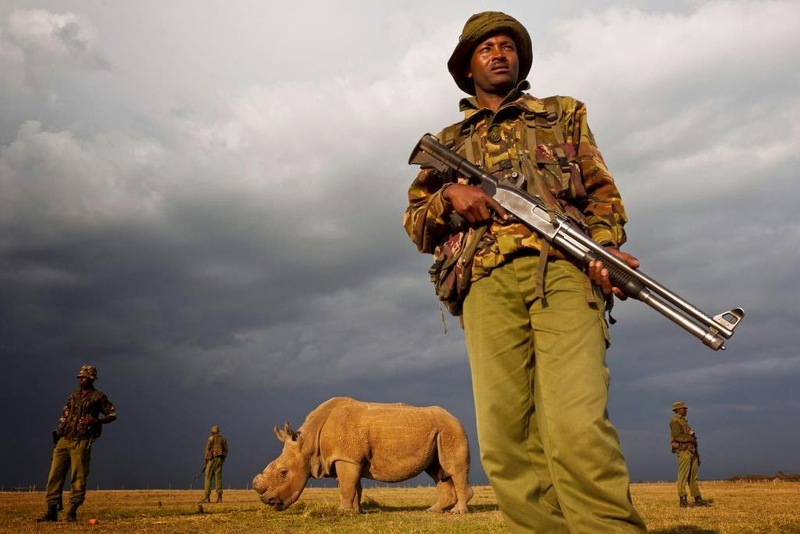 According to an interview with World of Animals, Simon Irungu, a ranger with the Ol Pejeta Conservancy, said armed patrols set out at dusk and return to camp by morning and often find themselves in the line of fire to protect the animals. The Ol Pejeta Conservancy is hoping to raise funds to keep the rhino rangers safe so there is a future for the animal. “Please keep giving and spreading the word, our wildlife’s future, depends on you,” the conservancy stated on its gofundme.com campaign.